We (as in Ellie, Kerry, Sadie and I) promised ourselves at the end of last season in September that we would not spend the winter as we usually do talking about all of the things we were going to make but meet up more regularly to make things. 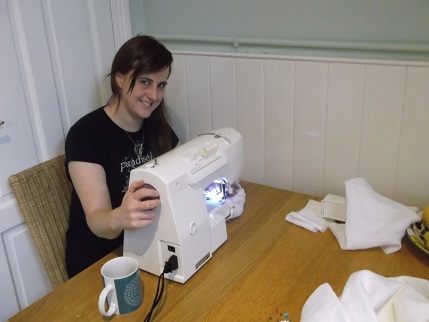 So we met again this weekend at my house for a second sewing weekend. This also included a little evening out to introduce Sadie to the delights of Marsden. I am exempt from having to make any large things as I am hostess so I feed and provide equipment and guidance if needed while the others get on with their stuff. 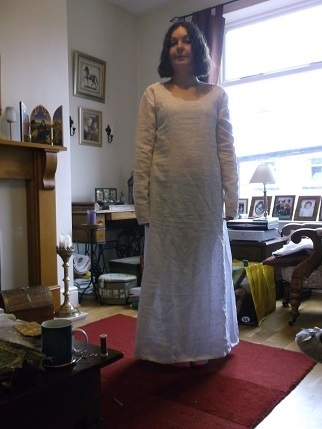 It was a very successful weekend with Kerry finishing two linings to go under her corset , working on a pair of cuffs for her gloves for next season and revising a dress. She has had her hair cut short which looks very lovely and donated the hair to a children’s cancer charity for making wigs for kids undergoing chemotherapy. Sadie was using her machine for the first time and it all went very well! Since we do so much work for English Heritage ( who have very strict guidelines on costume) we machine sew main seams then fold the seam allowance over and ‘stab stitch’ through to neaten the seams. This also hides the overlocking on the edge of the material. I usually then oversew the seams, both to cover up the machining and to provide extra strength. Some of the garments like shifts and hose and brais (the men’s undergarments) get a lot of wear and tear, particularly when worn under armour and this helps strengthen the seams. 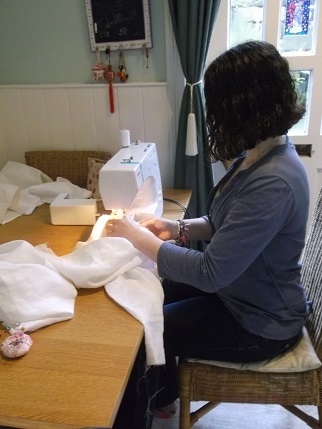 All hems are handstitched. 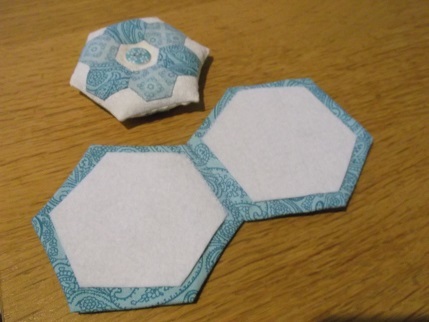 I did manage to finish a couple of things – hexis of course! 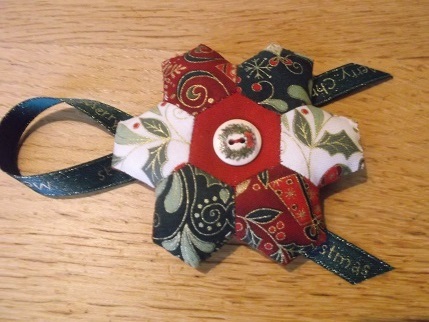 Here are two of my latest Christmas ornaments using a slightly bigger hexi and making two hexi flowers which are sewn together. 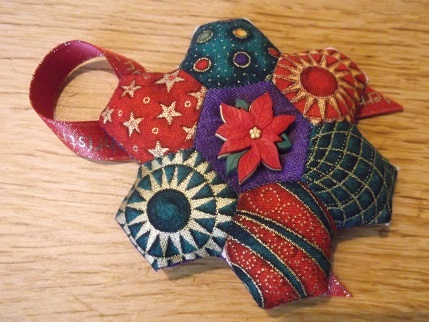 The flower for the backing is plain fabric with a patterned centre square. I am also making good progress with all of my hand-made gifts (though there will no doubt be a mad dash as usual at the end – luckily some don’t have to be finished until the 29th when I go to Spain!). 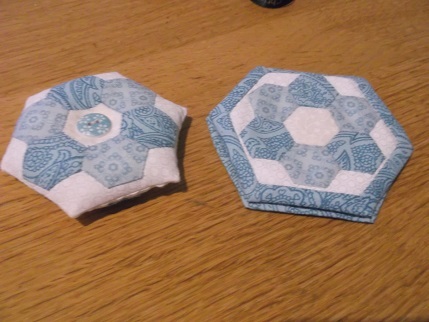 Below are the finished pincushion and needlebook. The scissor keep to finish the set is almost done, just needs the buttons and cord added. Of course the great excitement later this week is the visit to Harrogate Knitting and Stitching Show! I have set myself quite a strict budget which I intend to spend on charm packs and buttons. Meanwhile stay happy and thanks for visiting.